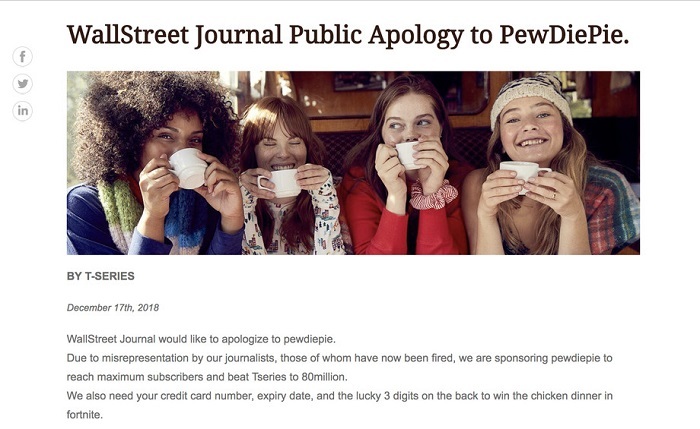 For this matter, a representative of WSJ clarified to the media TheVerge that they had realized the problem and launched a comprehensive investigation: “The page was owned by WSJ. Custom Solutions, a unit of the advertising arm, which is not affiliated with The Wall Street Journal newsroom.” Although the Wall Street Journal has removed this page, you can see it on the web cache. In order to compete with the sudden rise of the T-Series, fanatic fans are also actively conducting activities online, buying billboards in Times Square and around the world to attract others to subscribe to PewDiePie’s YouTube channel.